I guess it wasn’t just the heat. Baby-kitty’s left cheek by his nose/under his eye is swollen. I’m guessing it’s one of two things: tooth problem, or he ran his face into something. Like a door. Ever since we’ve moved here, he’s liked to sit in front of the front door, and a few times we’ve come close to smacking him with it - y’know how pets are and how that happens now and then. One of those times happened last week as I came home with groceries…but I was pretty certain the door didn’t hit his face, if it actually hit him at all. Of course, now I’m trying to go mentally back in time, wondering if the door really did hit him, and it took a few days for the swelling to be noticeable, or something. Then again, he’s nearly 18 years old, and it could be a tooth abscessing. I’ve tried looking at his gums/teeth, and don’t see anything super red or inflamed, and none of his longer teeth seem loose or anything, so I dunno. His face might’ve been slowly swelling up the past few days for all I know, but I only noticed it Sun. morning, when it became large enough to make his face ‘look funny’. A third possible is allergy or insect bite. He’s never been allergic to anything before, and being an indoor cat his environment doesn’t change much. Can’t think of anything in that regard. Insects…maybe a spider, but there aren’t lots of black widows like down in south San Jose and…well, who knows. I always do this…stay up all night 2nd guessing what ifs. Heh. He still wants to/does eat/drink, just not very much at a time - the swelling seems to make it uncomfortable for him to use his tongue or something, so he doesn’t want to “lap” much. He doesn’t seem to be in any major pain, and I can touch his cheek and stuff and he doesn’t yowl or even seem to mind all that much, so it’s not super-touch sensitive. But if the swelling doesn’t go down he’ll eventually starve from not enough calories. Anyway, he’ll be going to the vet. He’s old, but I can at least get him some x-rays or something to see if it’s something fixable like a bad tooth. He was doing pretty well for his age, up to this point. A little hip-arthritic, but those epileptic-like seizures he was having a while back largely stopped after putting him on a better wet-food diet, and his mood’s been good. Sigh. Poor Baby. I hope it’s just a tooth or bruise-swelling. 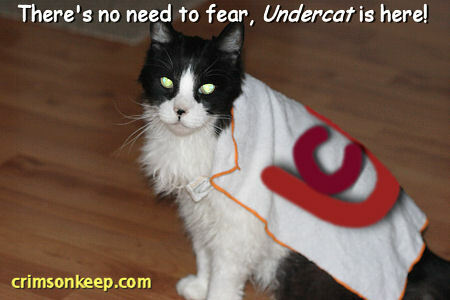 There’s no need to fear, Undercat is here! 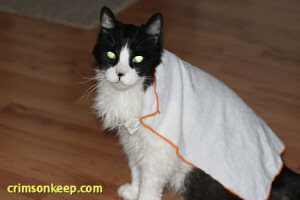 My fuzzy hero. If you’ve don’t understand the post title reference, you’ve never seen Underdog. Shame on you. 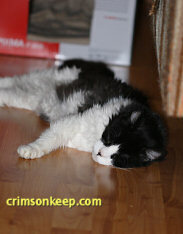 Ye olde kitty has been wilting in the heat, so I occasionally wet a rag with water and dampen his fur a little. Sometimes I drape the rag over his back for a few minutes. Yes, he likes it. At first I was just going to post the original pics (below), but then during a burst of boredom I turned Baby into Undercat. 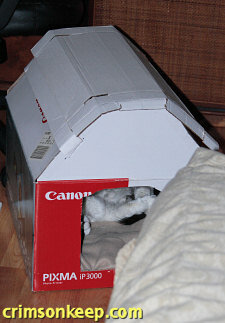 Not long after I made Baby-kitty a simple, enclosed sleeping bed out of a cardboard filing box, I decided it wasn’t long enough. 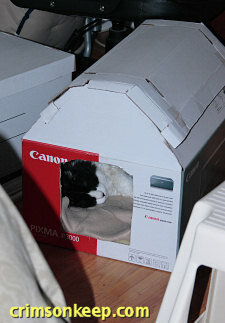 So I took an old printer box and the lid from the filing box to create a new bed. This took a bit more cutting work, to create the sloped “roof line” that gives it a sort of barn roof shape. The main box is heavier cardboard, which is also good. And as you can see below, Baby is as pleased by this hidey-bed as w/my earlier version. He can even stretch out lengthwise, somewhat, if he wants. My biggest amusement (I’m easily amused…) is how Baby often initially crawls into the box and sits/lies down with his tail hanging out of the entrance and onto the floor. 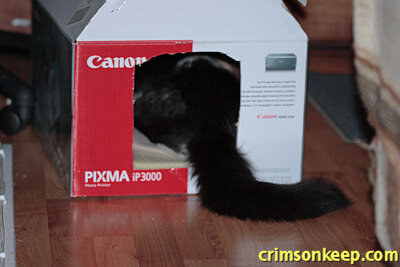 He’ll stay like that for a long time - I bet he thinks he’s “hidden” and forgets that he has a tail. After all, cats don’t have very big brains, y’know. Due to Baby-kitty being unhappy about not having a good “hidey hole” for when he’s feeling stressed out, I’ve been on the look-out for some kind of solution. His normal sleeping basket - a wicker basket I got for free out of a garbage can years ago - is great, and he loves it, but it’s too open. When I do loud housework or guests come over, he freaks out and desperately wants to get into the bedrooms to hide, which typically is a no-no. Baby is sweet and lovable if he trusts you, but he’s not exactly a brave or social cat. They’re cute and they’re fuzzy. But there’s some problems. One, they’re almost always too small - big enough for kittens or very small cats, but Baby is pretty long and tall and doesn’t always want to sleep in a tightly curled packed ball shape. 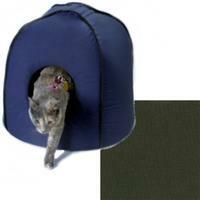 Somewhere down the line, commercial pet-supply makers seem to have decided that all cats weigh 6 pounds and are tiny. Half of the cats I’ve owned have been over 12 pounds with giant paws and large bones. Or they were just fat. Tiny cat beds won’t work. A second issue I have with them is that while they claim to be washable, well, if you’re a cat owner, you know how much hair a cat can shed into fuzzy bedding in just a single day. Who’s going to brush-out and wash the thing every day? Not I. And at the end of a week, it’d be so full of hair it’d probably clog the washer. Hahaha. 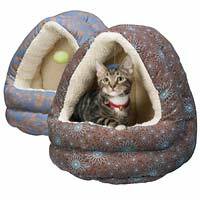 The third issue is that most of these pre-made cat beds cost $25, $35, $50 or more. For a little bit of sewed-together cloth and thin foam padding that you’re likely going to toss in several months, because it’s so infested with cat hair that you don’t want to deal with it anymore. It’s stupid. So I muttered to myself: “Self, you knew it was unlikely you’d want to pay for these, so it’s back to making your own, cheap, cat bed thingy.” The first thing I did was look at the plastic, covered litter-pans. They’d be ideal, since they have lids, are easily cleanable, and already have a hole cut in them. But again, pet stores wanted $20 for smaller ones, or $25-30 for the ones I thought were the right size…and there were even these big, round, igloo shaped ones for $60. $60 for a plastic covered litter pan, that’s not even one of those electric auto-scooper ones. 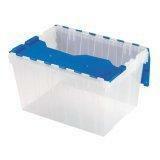 A rectangular, non-covered basic plastic litter tray costs $5-$7. I’m not paying an extra $20+ because it has a tall lid! It’s crazy! I refuse to pay! While this 12-gallon storage bin would work (if it wasn’t clear plastic and had a solid lid cover), the problem is they’re too big, and we don’t have big rooms where a cat bed can have a large footprint and not be in the way. I looked for something smaller, but then the issue became that the storage bin wasn’t tall enough, or wide enough, or … sheesh, you’d think finding a plastic bin the right size for your kitty wouldn’t be that hard? I gave up for a while. But then, this afternoon I spent some time emptying a few more boxes of books that were still unpacked from moving. The boxes were file-storage type cartons…cardboard with separate lids. They’re a nice size for packing paperback books and such and are fairly strong. I started tossing them to the side to be broken down later, then stared at them for a while. Now, I’ve made cat beds out of cardboard boxes before. Who hasn’t, right? And I had considered doing it again. But most of our moving boxes were too big for the purpose, or again, weren’t tall enough, or wide enough, etc. And they didn’t have separate lids, either. 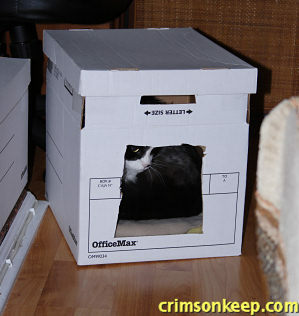 These file boxes were a little small…Baby wouldn’t be able to lie down stretched out fully or anything, but they were bigger than those expensive fuzzy covered cat beds from the pet stores, so he wouldn’t have to sleep completely curled up, either. They didn’t seem quite tall enough tho - with the lid on, Baby wouldn’t even be able to sit half-way up. I pondered a while, and then re-raised the small flaps that are supposed to fold down inside the top of the box for strength, and taped the flaps together at the corners so they’d stay upright. I put the lid back on top, and now the box was 3 or 4 inches taller. I cut out a hole. 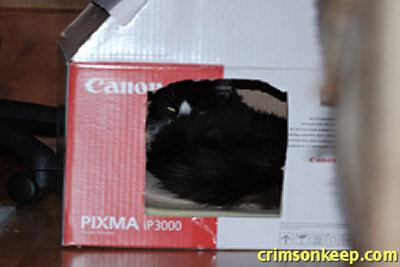 Then I took an old foam mattress pad (I hang on to old ones for cat bedding), cut a piece out, and put it inside the box. Then covered the foam with a piece of blanket (I buy cheap $6 throw-blankets at the supermarket that I can cut 4-5 cat-bed size pieces from), and set it on the floor near Baby’s wicker basket. Baby, meanwhile, was lying in the basket the whole time, pretending to snooze but really watching me…and so I looked at him and said “Baby, I made a hidey-box for you.” Since Baby apparently understands English, he immediately climbed out of his basket, sniffed at the box for a second, and crawled right in. He hasn’t come out since, so I’d guess he likes it. If I felt like it, I could also cover the outside of the box in shelf paper or something to make it look a tad less ugly. 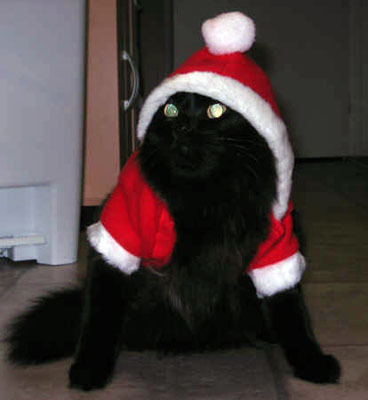 I is not Santa Claus! The contrast of the black cat to the red/white Santa sweater/hoodie makes it “pop” and the glowing green eyes and expression are priceless. 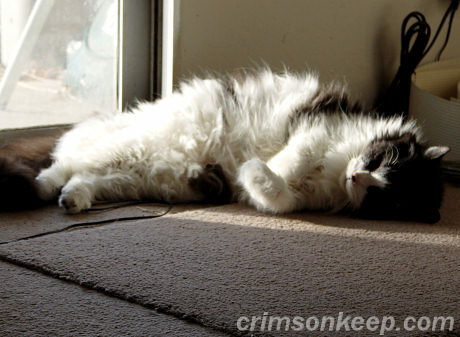 I’ll take that sunbeam for 10 pts. My cat Baby has been feeling old and sick lately and I suspect he won’t last a whole lot longer. I think he’s been feeling the cold of winter more than in past years, and during one of the sunny days last week he kept walking over to the sliding glass window and sitting in front of the closed vertical blinds. Once it became late enough for the sun to start hitting that glass door, I opened the blinds a little bit and he promptly lay down in the ensuing sunbeam to take a nap. He’s had a good time being the “only cat” these past 8 months or so, after ending up being the only remaining kitty alive of my once-9-cat brood. I’m not sure if he’ll be making the move to the new house or not -still assuming that this move will be taking place, of course - it might be more stress than he could handle in his condition. We shall see. … when I hold out a finger now, he starts to make an attempt to rise, but then stops and just looks at my hand. So now I have to bring my finger down to him so he can still happily chew on my fleshy digits.